Michael McFadyen's Scuba Diving - The Pinnacle I do not know how many dive sites in the world are called The Pinnacle, but there must be thousands. This is yet another. 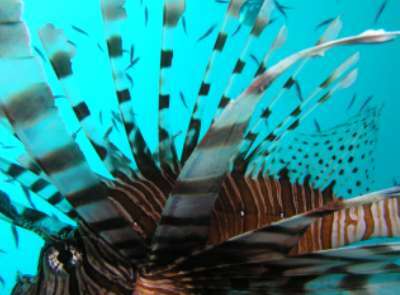 This site is found to the north-west of Port Moresby Harbour in Papua New Guinea on the outside of the fringing reef. The reef that runs from the main entrance to the harbour, Basilisk Passage, is called Sinavi Reef . It runs up past Fishermen's (Dango) Island and is west of the island. The wall here runs east-west and there are three cracks in the reef that extend from the shallows to the deeper water. The wall has a couple of indents or bays. After anchoring on the reef top in five metres, you drop over the wall to a ledge at 10 metres and then a wall to 30 metres. The bottom then slopes steeply to 60+ metres. From the anchor we dropped to the bottom of the wall and then headed down the slope and to the west. After about four minutes you see The Pinnacle. This is not a pinnacle as most divers would think of it, reaching to the sky, but it comes up from 50 to 60 metres to about 32 metres. The pinnacle is not big, say 20 x 20 metres on the top and 50 x 50 metres on the bottom. We did not see any sharks but they are commonly seen here. From the pinnacle it is a short swim north to the reef proper and there is a huge overhang here. It is a simple matter of swimming to the east along the wall, examining the small cracks as you go. There are plenty of crayfish along here as well as firefish. On the reef top there are many anemones and clownfish and you can spend a long time here. This was a nice dive, visibility over 30 metres and water temperature 25.8°. The dive operation in Port Moresby does not dive this site as they have their boat based south at Bootless Bay. The only way you can dive the plane is with the Port Moresby Sub Aqua Club - Google them and they may take you out diving if you are visiting Port Moresby.